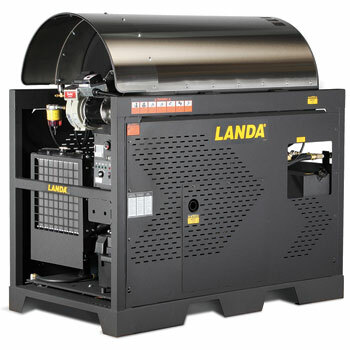 Landa HOT Series Hot Water Pressure Washers - durable and reliable hot water pressure washers offering a diesel burner matched with our long lasting Dura-Coil made with cold rolled Schedule 80 steel. These portable, electric power washers are engineered to deliver up to 3.5 GPM at 1500 - 2000 PSI for removing grease, grime, oil and reducing germs. They feature flat free tires, belt or direct-drive pumps backed by a 7-year warranty and all units are ETL certified to UL and CSA safety standards. Landa PHW Series Hot Water Pressure Washers - these hot water pressure washers are workhorses of the hot water industry, featuring patented Cool-Bypass technology that limits the temperature buildup in the pump during periods of inactivity, as well as, LanCom wireless remote control, auto start-stop and a belt-drive Landa pump backed by a 7-year warranty. Engineered to remove grease, grime, oil and reduce germs, these electric units deliver up to 4.8 GPM at 1000 - 3000 PSI. All units are ETL certified to UL and CSA safety standards. 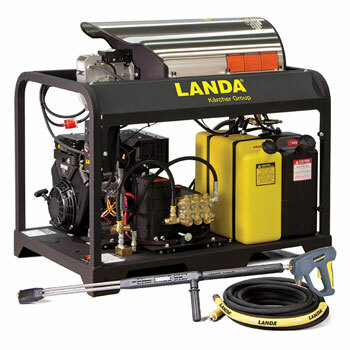 Landa ENG (Natural Gas or LP) Series Hot Water Pressure Washers - compact stationary natural gas or LP heated units deliver up to 9.5 GPM at 3000 - 3200 PSI to remove grease, grime, oil and reduce germs. These hot water units feature patented Cool-Bypass technology that limits the temperature buildup in the pump during periods of inactivity, Landa’s True-Tite belt tensioning system, and the Fielder’s Choice system – allowing you to switch the inlet and outlet connections from one side to the other. These hot water pressure washers come with a Landa pump backed by a 7-year warranty, and all units are ETL certified to UL and CSA safety standards. 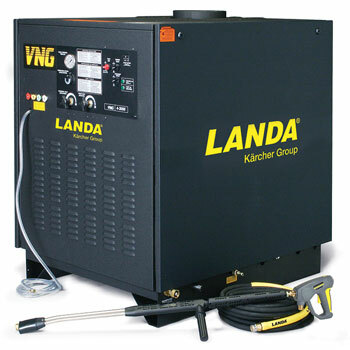 Landa VHG (Electric) Series Hot Water Pressure Washers - electric hot water pressure washers engineered to remove grease, grime, oil and reduce germs. These very compact Natural Gas or LP heated stationary units deliver 3.5 – 8.0 GPM at 2000 - 3000 PSI and feature patented Cool-Bypass technology that limits the temperature buildup in the pump during periods of inactivity, smart control over run time, auto start / stop and shutdown, and a belt-drive Landa pump backed by a 7-year warranty. All units are ETL certified to UL and CSA safety standards. 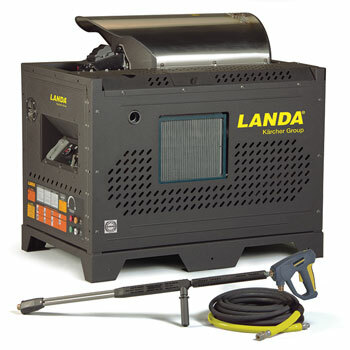 Landa VNG Series Hot Water Pressure Washers - housed in a sturdy metal cabinet, these hot water pressure washers provide easy access to its indicator lights and control panel, and they offer up to four optional remote wash stations. These compact electric power washers deliver up to 10.0 GPM at 2000 - 3000 PSI and feature time delay shutdown, electronic ignition and pressure gauge, as well as, smart control over run time, auto start / stop and shutdown. They come with a belt-drive Landa pump backed by a 7-year warranty, and these units are ETL certified to UL and CSA safety standards. 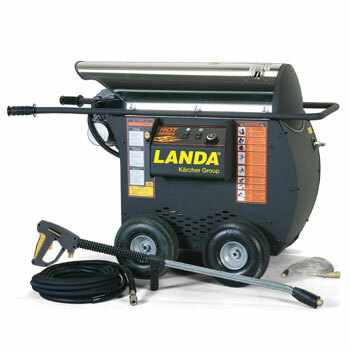 Landa VHP Series Hot Water Pressure Washers - offered in both 120V and 230V configurations, these portable LP heated, hot water pressure washers deliver up to 2.5 GPM at 1500 - 2000 PSI. Built on a rugged 10 gauge steel chassis with weather resistant powder coat paint, extra-durable heating coil made of leak-free, cold-rolled Schedule 80 steel pipe and a belt-drive Landa pump backed by a 7-year warranty, these electric power washers are a heavy-duty series. All units are ETL certified to UL and CSA safety standards. Landa EHW Series Hot Water Pressure Washers - enclosed in a stainless steel cabinet and mounted on a platform, these electric hot water pressure washers generate no fumes or noise and are easy to store. They deliver up to 4.2 GPM at 2000 – 3000 PSI and are engineered to remove grease, grime, oil and reduce germs. The EHW power washers feature a belt-drive Landa pump backed by a 7-year warranty, and all units are ETL certified to UL and CSA safety standards. 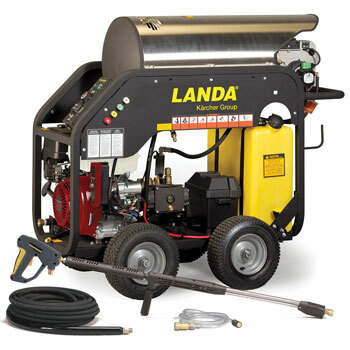 Landa MHC Series Hot Water Pressure Washers - electric hot water pressure washers with an advanced engine-and-regulator combination that eliminates the need for a battery or electrical connection, and an adjustable thermostat and hour meter. These portable power washers deliver up to 3.5 GPM at 2500 - 3000 PSI to remove grease, grime, oil and reduce germs. They feature a Schedule 80 heating coil with stainless steel top wrap, a direct-drive Landa pump backed by a 7-year warranty, and all units are ETL certified to UL and CSA safety standards. 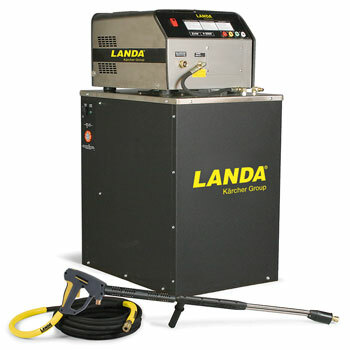 Landa MHP Series Hot Water Pressure Washers - gas hot water pressure washers engineered to remove grease, grime, oil and reduce germs. These portable units deliver up to 3.5 GPM at 3000 - 3500 PSI and feature an extra narrow chassis and frame, Schedule 80 heating coil, Honda or Vanguard engines with keyed electric start, and a belt-drive Landa pump backed by a 7-year warranty. All units are ETL certified to UL and CSA safety standards. 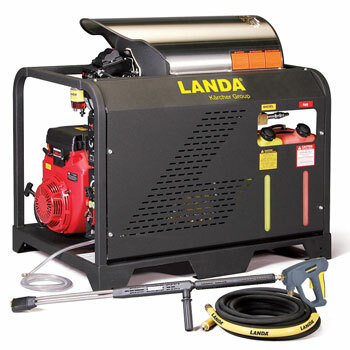 Landa PGDC Series Hot Water Pressure Washers - rugged skid hot water pressure washers that use a 12-volt DC burner and a heavy-duty Honda or Vanguard engine with keyed electric start. Engineered to remove grease, grime, oil and reduce germs, these gas skid units deliver up to 4.7 GPM at 3500 PSI and feature a rupture disk, high-temperature shutoff, thermal pump protector, and a belt-drive Landa pump backed by a 7-year warranty. All units are ETL certified to UL and CSA safety standards. 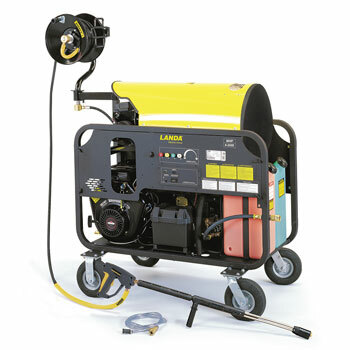 Landa PGHW Series Hot Water Pressure Washers - classic gas hot water skid unit with a compact footprint removes grease, grime, oil and reduces germs. These pressure washers are built with a rugged 1-1/2 inch square tube, open-air frame with forklift guides, rust-free float tank for backflow protection, inlet detergent injection, and a belt-drive Landa pump backed by a 7-year warranty. Delivering up to 5.0 GPM at 5000 PSI, these skids are ETL certified to UL and CSA safety standards. Landa PDHW Series Hot Water Pressure Washers - offered in either a sturdy steel frame powder coated or all stainless steel pressure washer, the PDHWs feature an industrial-duty Kubota diesel engine with keyed electric start, 2,900-watt generator and a 120V outlet, forklift guides and mounting brackets, and a belt-drive Landa pump backed by a 7-year warranty. These gas hot water power washers deliver up to 4.7 GPM at 3500 PSI to remove grease, grime, oil and reduce germs. All units are ETL certified to UL and CSA safety standards. 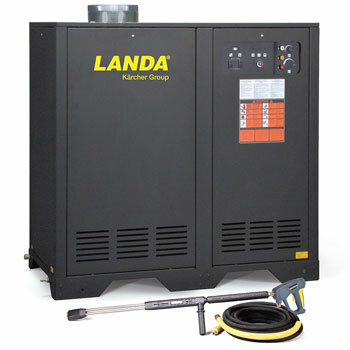 Landa SLX Series Hot Water Pressure Washers - these large skid units deliver up to 9.8 GPM at 2500-2800 PSI and feature oversize vibration isolator cushions, extra-large heating coils and fuel tanks, and either a diesel Kubota engine or gasoline Honda engine. Offered in gas or diesel, these hot water pressure washers provide enough water flow to operate two spray guns at the same time and effectively remove grease, grime, oil and reduce germs. All units come with a belt-drive Landa pump backed by a 7-year warranty, are ETL certified to UL and CSA safety standards. 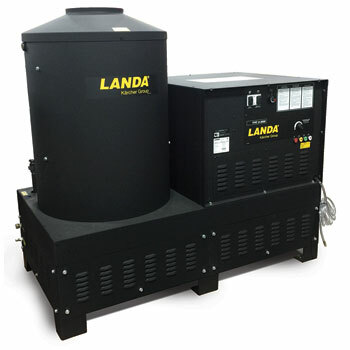 Landa SLT Series Hot Water Pressure Washers - large skid units provide enough water flow to operate two spray guns at the same time and effectively remove grease, grime, oil and reduce germs. Offered in gas or diesel, these hot water pressure washers deliver up to 8.0 GPM at 3000 - 3200 PSI and feature oversize vibration isolator cushions, extra-large heating coils and fuel tanks, and either a diesel Kubota engine or gasoline Honda engine. pressure All units come with a belt-drive Landa pump backed by a 7-year warranty, are ETL certified to UL and CSA safety standards. 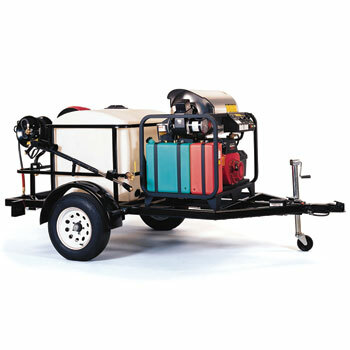 Landa ECOS Mobile Wash System - gas powered, hot water mobile wash and reclaim system is a combination of a hot water pressure washer with a wastewater recovery and filtration system on a trailer unit. This patented mobile wash system offers four polyethylene water tanks that provide 400 gallons of cleaning water, dual fuel tanks, patented Trans-Heat Technology to capture exhaust from the engine and preheat water and reliable Honda engines. All ECOS trailers come with a commercial-grade pump backed by a 7-year warranty and are ETL certified to UL and CSA safety standards. 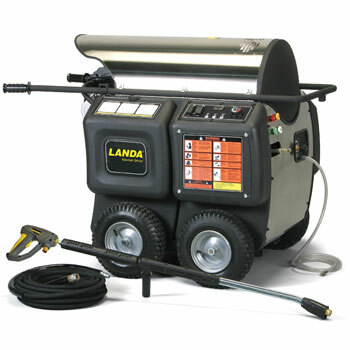 Landa TR – 3500 Mobile Wash System - TR – 3500 – is a customizable mobile wash system that accommodates a variety of Landa hot water pressure washers engineered to remove grease, grime, oil and reduce germs. This 3500 lbs (GVWR), single-axle trailer with a 200 gallon water tank offers a rugged tubular frame with recessed electrical wiring, a 25/16 inch ball coupler and electric breaks and break away kit. 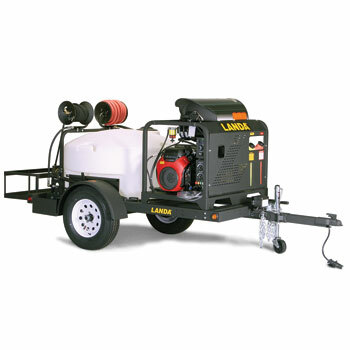 The Landa hot water pressure washers it accommodates are certified to UL and CSA safety standards. 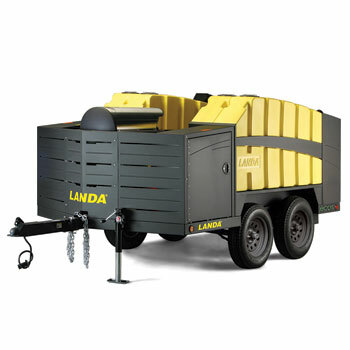 Landa TR – 6000 Mobile Wash System - is a customizable mobile wash system that is a 6000 lbs (GVWR), tandem-axle trailer with a 330 gallon water tank and offers a rugged tubular frame with recessed electrical wiring, a 25/16 inch ball coupler and electric breaks and break away kit. 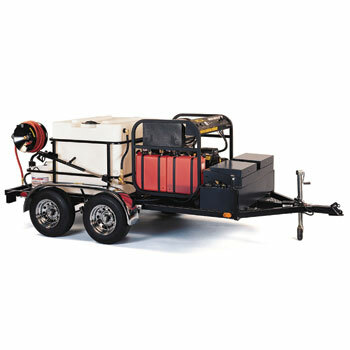 This trailer accommodates a variety of Landa hot water pressure washers engineered to remove grease, grime, oil and reduce germs, and all the Landa hot water pressure washers it accommodates are certified to UL and CSA safety standards. Landa TRV – 3500 Mobile Wash System - single or tandem-axle trailer is a customizable mobile wash system that offers a 200 or 230 gallon water tank with a rugged tubular frame, recessed electrical wiring and electric brake kits. 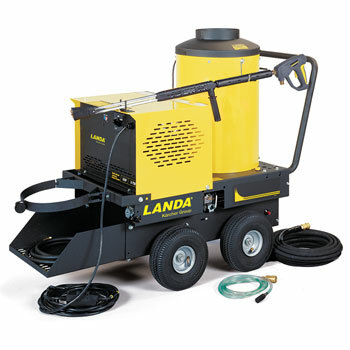 This mobile wash system accommodates a variety of Landa hot water pressure washers engineered to remove grease, grime, oil and reduce germs, all the Landa hot water pressure washers it accommodates are certified to UL and CSA safety standards.